Winter blues got you down? Once the holidays settle and the world is shrouded in snow, it can be hard to muster up the desire to do anything but snuggle inside with a mug of cocoa and watch reruns of The Office. But, wait. Have you thought about taking a road trip? Yes, we realize Kevin and his vat of chili can seem more enticing than jumping in the car when it’s freezing outside. However, winter might just be the best time to hit the open road, because 1) less tourists means less traffic, and 2) it just might end up being your most majestic road trip yet! We are lucky to live in a beautiful country with seemingly endless scenic drives – many of which are made all-the-more breathtaking by long winter shadows on thick blankets of snow and ice. Honestly, what more could you ask for? Now that you’ve gotten your car scraped off, heated seats warmed up, and snow tires at the ready, drive on with confidence into these 6 unique winter wonderlands. 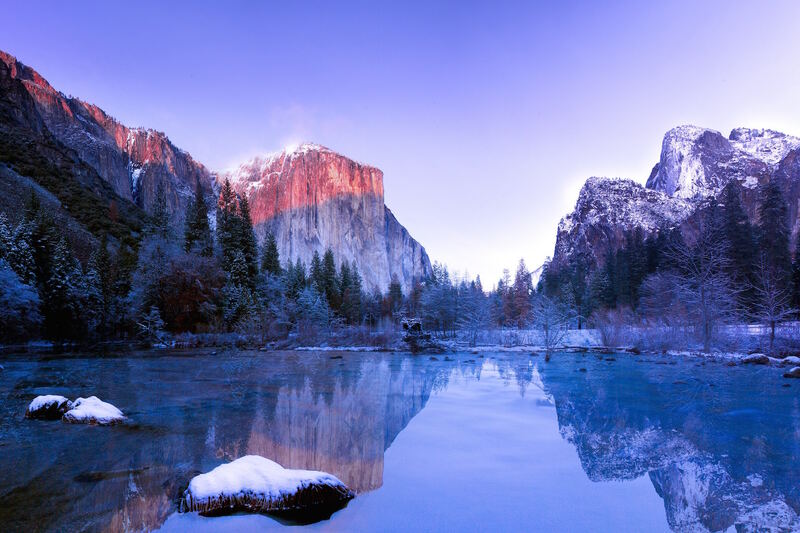 We picked our favorite winter road trip destinations so all you have to do is go! Lake Tahoe, Nevada: The ultimate winter destination for snow bunnies, the drive around Lake Tahoe during winter is simply a sight to behold. Start your journey at Incline Village and make your way all the way around the lake’s 27 mile circumference. Be sure to stop off at Sand Harbor to dip a toe into the icy waters (fun fact: the lake never gets cold enough to freeze, but that definitely doesn’t mean it’s warm enough for anything except a Polar Bear plunge). Don’t forget to bring your camera to capture the snow-dusted Sierra Nevada mountains reflected in the glassy surface of Lake Tahoe’s crystal clear water. Zion National Park, Utah: Zion was Utah’s first national park, and when you experience its endless beauty, you’ll understand why this place is named “Promised Land.” Shorter days mean longer shadows, so be sure to grab your camera for some epic winter desert photography; the white snow looks particularly striking against Zion’s giant stratified rock sculptures. White Mountains, New Hampshire: Fancy a twisty-turny scenic mountain drive? Get lost in an idyllic New England winter landscape with a drive in New Hampshire’s White Mountains. Make a pit stop in Jackson, NH, where the coffee is hot and the powder plentiful before jumping back on the road and continuing your New England winter journey. Glacier National Park, Montana: This 50-mile drive drops scenic view after scenic view and doesn’t care who knows it. Going-to-the-Sun road cuts Glacier National Park in half, and snow-covered forests, icy lakes, and frosted mountaintops surround both sides of the road. You may want to go extra slow for this drive so you don’t miss a single thing (including wildlife)! Yellowstone National Park, Wyoming: Making the 52-mile drive along Grand Loop Road in Yellowstone during winter may be one of the most awe-inspiring road trips ever. If you look carefully, you may be able to spot packs of wolves roaming the desolate landscape. Be sure to have your brakes at the ready if a bachelor bison (an older male bison that has left the herd) wanders into your path. Badlands, South Dakota: Though the temperature may hover “below the donut” (aka subzero), it will all be worth it to see a light dusting of snow on the impressive rock formations of the South Dakota Badlands. Begin your journey on South Dakota Highway 240 in Wall, SD and be sure to make frequent stops throughout the day at the many scenic lookouts. During this time of year, you’d be hard-pressed to find anyone else poking around except park rangers and some bighorn sheep. If the winter weather forces you to change direction or turn back, always be sure to have a plan B in place. Who knows, the road trip could end up being even more spectacular! Also, it never hurts to have an emergency kit in the car, including: a flashlight with fresh batteries, a blanket, a lighter, snacks, bottled water, gloves, boots, an ice scraper, jumper cables, and a first aid kit. Us Metromilers love and encourage road trips, which is why we cap your miles at 150/day (250 in New Jersey), so get a quote today and start planning your next winter road trip! And here’s the most important question of all: where should we go first?